Well, yesterday was an interesting day..... just when we're getting this blog rolling again, we're unable to get to it for a new entry because of a major phone, internet outage we had here in Santa Cruz County. 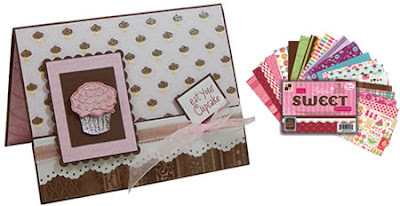 Anyhoo ..... we're calling this post "from the mailer", because, Kathy, out resident artist created a darling card using an item that's in this month's mailer - DieCuts With a View's SWEET Mat Stacks. In fact she used this paper line when she decorated the Countdown Calendar that's featured in the April mailer as well. Hope that inspires you - have fun creating! We'd love to see what you come up with. Also, basssinger asked in the last post: "The knitting & crocheting books look very interesting. Is there a way that I can order them?" Well, Bassinger, there's a couple of ways to answers that question. Your local Beverly's should have it. If they don't have it in the store, they can order for you. Or if you want to order it yourself on-line, you can do so here. We'll be having a terrific giveaway next week, so make sure to come back to participate.